Red Right Return is phenomenal, a massive piece of near perfect modern rock sensibilities. This masterpiece is truly driven by outstanding hooks fueled by frontman David Scotney’s vocal multi-tasking. His melodies are the main focal point of Red Right Return and he isn’t wasting his time in the spotlight. He is somewhat a hybrid; crafting intricate vocal harmonies like Breaking Benjamin’s Benjamin Burnley (‘Say It’), yet he can be aggressive when need be like Framing Hanley’s Nixon (‘Eyesore’). This is as captivating and engrossing as rock records come - it is polished and well produced. There is no doubt that the boys put a lot of time into Red Right Return, and it shows. This is a multi-faceted rock record, one that conveys many moods and emotions. It can be endearing (‘Maybe It’s You,’ ‘Your Arms’) and staggeringly immense (‘100 Years’), all the while remaining effectively powerful. Perhaps the most engaging facade of Red Right Return is its lingering charm. This is a record that will stick with you, a characteristic many rock albums sadly do not boast. It shouldn’t be long before this Chicago quartet rightly takes their place atop modern rock’s throne. Hell, with how good Red Right Return is, they very well might be considered rock music’s ‘it’ band right now. 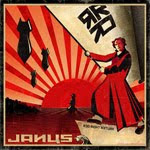 Janus is one of the best modern rock bands on the scene today, and with their talent and an album like Red Right Return, these guys might be an unstoppable force.